Behzad Ranjabaran is known for music which is both evocative and colorful, and also strong in structural integrity and form. He frequently draws inspiration from his cultural roots and Persian heritage in form or subject matter, as exemplified by the tone poems of the “Persian Trilogy”, or the interpretation of sounds and styles in works such as the Violin Concerto and Songs of Eternity. Ranjbaran’s music has been performed all over the world, including South Korea, where Awakening (commissioned by Sejong Soloists) premiered at the Great Mountains Music Festival as a celebration of peace. His music has been performed by soloists such as Joshua Bell, Renée Fleming, Jean-Yves Thibaudet, and Yo-Yo Ma, and conductors including Charles Dutoit, Marin Alsop, Robert Spano, Gerard Schwarz, JoAnn Falletta, David Robertson, and many more. He has also served as composer in residence for the Philadelphia Orchestra’s summer season at Saratoga, the Fort Worth Symphony, and the Cabrillo Festival of Contemporary Music. Some of his more notable compositions include works for soloist and orchestra. Songs of Eternity, using text from the Rubáiyát of Omar Khayyám, was written for soprano Renée Fleming, and premiered with the Seattle Symphony under the direction of Gerard Schwarz. Joshua Bell was the soloist in the premiere performances of his Violin Concerto with the Royal Liverpool Philharmonic Orchestra, also conducted by Schwarz. Mr. Bell went on to give the North American premiere with the Indianapolis Symphony under Mario Venzago, and gave subsequent performances with Peter Oundjian and the Toronto Symphony. Jean-Yves Thibaudet premiered the Piano Concerto with the Atlanta Symphony, conducted by Robert Spano; Thibaudet and Spano have since also performed it with the Philadelphia Orchestra. The texts for two choral works also draw directly on Persian culture, as do some of his many chamber works, including Fountains of Fin, a eulogy for Amir Kabir, the 19th century slain Iranian vezir; Shiraz and Isfahan, celebrating two of Mr. Ranjbaran’s favorite cities in Iran; and Enchanted Garden, inspired by the many beautiful gardens of his native land. Recordings include the “Persian Trilogy” on the Delos label by the London Symphony Orchestra, conducted by JoAnn Falletta. This orchestral cycle, comprising the works Seven Passages, Seemorgh, and The Blood of Seyavash, takes its inspiration from ancient Persian legends, as recounted in the 11th century epic poem “Shahnameh” (The Book of Kings). In 2008, the Toronto Symphony Orchestra performed a multimedia performance of the complete Persian Trilogy, with traditional storytelling (Naghali) and projections of Persian miniatures. 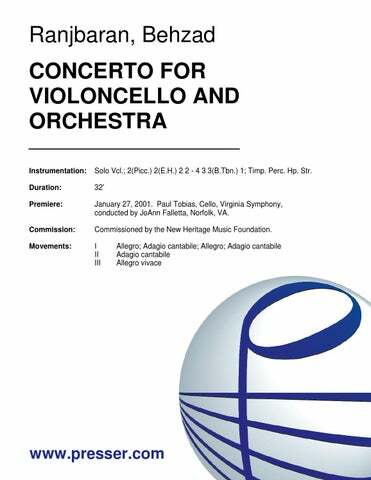 Ms. Falletta has also conducted Elegy for Cello and Orchestra with soloist Yo-Yo Ma and the Buffalo Philharmonic, reviewed in the Buffalo press as “ethereal…fragile, almost like a mirage” Among his other recordings is an all-Ranjbaran album of string music on Naxos, including Awakening, String Quartet, Elegy, and more. Born in 1955 in Tehran, Iran, Mr. Ranjbaran is the recipient of the Rudolf Nissim Award for his Violin Concerto. His musical education started early when he entered the Tehran Music Conservatory at the age of nine. He came to the United States in 1974 to attend Indiana University and received his doctorate in composition from The Juilliard School, where he currently serves on the faculty. for String Orchestra 13:00 Str. 43:00 3(Picc.) 3(E.H.) 2 2 – 4 3 3(B.Tbn.) 1; Timp. Perc. Cel. Hp. Str. for Orchestra 25:00 3(Picc.) 3(E.H.) 2 2 – 4 3 3(B.Tbn.) 1; Timp. 3Perc. Cel. Hp. Str. 16:00 3(Picc.) 3(E.H.) 3(B.Cl.) 3(C.Bsn.) – 4 3 3(B.Tbn.) 1; Timp. 3 Perc. Cel. Hp. Str. 20:00 3(Picc.) 3(E.H.) 2 4 – 4 2 2(B.Tbn.) 0; Timp. Perc. Cel. Hp. Str. for Orchestra 7:00 3(Picc.) 3(E.H.) 3(B.Cl.) 3(Cbsn.) – 4 4 3(B.Tbn.) 1; Timp. 5Perc. Xyl. Mar.(Vib.) Glock.Ho. Str. 22:00 3(Picc.) 3(E.H.) 3(B.Cl.) 3(Cbsn.) – 4 3 2 1; Timp. 3Perc. Cel. Hp. Str. 15:00 3(Picc.) 3(E.H.) 3(B.Cl.) 3(Cbsn.) – 4 3 3(B.Tbn.) 1; Timp. Perc. Cel. Hp. Str. 25:00 Solo Cb. ; 3(Picc.) 3(E.H.) 2 2 – 4 3 3(B.Tbn.) 1; Timp. 3Perc. Cel. Hp. Str. 28:00 Solo Fl. ; 3(Picc.) 2 2 2 – 4 3 3(B.Tbn.) 1; Timp. 3Perc. Cel. Hp. Str. 30:00 Solo Piano; 3(Picc.) 3(E.H.) 3(B.Cl.) 2 – 4 3 3(B.Tbn.) 1; Timp. 4Perc. Cel. Hp. Str. 25:00 Solo Vla. ; 2(2nd dbl. Picc.) 2 2 2 – 4 3 3(B.Tbn.) 1; Timp. 3Perc. Cel. Hp. Str. 31:00 Solo Vin. ; 2(dbl. Picc.) 2(dbl. E.H.) 2 2 – 4 2 2 0; Timp. 2Perc. Cel. Hp. Str. 26:00 Vln., Vla. Soli; 2(2nd dbl. Picc.) 2 2 2 – 4 2 1 1; Timp. 2Perc. Hp. Str. 31:00 Solo Vcl. ; 2(Picc.) 2(E.H.) 2 2 – 4 3 3(B.Tbn.) 1; Timp. Perc. Hp. Str. for Cello and Strings 7:00 Solo Vcl. ; Str. for Clarinet and Strings 7:00 Cl., Str. for Solo Violin and Strings 5:00 Solo Vln., Str. 16:00 Solo Vcl., Narrator; 2(Picc.) 2 2 2 – 4 3 3(B.Tbn.) 1; Timp. 2Perc. Hp. Str. 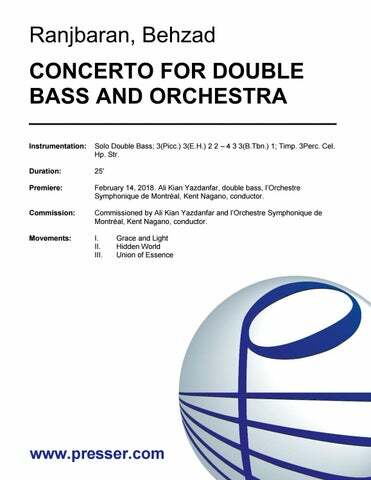 for Chorus and Chamber Orchestra 13:00 SATB Chorus; Fl. Ob. Cl. Perc. Hp. Vn. Vla. Vcl. for Soprano and Orchestra 17:00 Solo Sop. ; 2 2(E.H.) 2 2 – 2 2 1 1; Timp. Perc. Hp. Str. 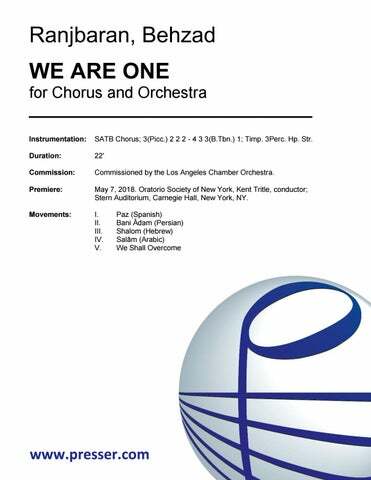 for Chorus and Orchestra 22:00 SATB Chorus; 3(Picc.) 2 2 2 – 4 3 3(B.Tbn.) 1; Timp. 3Perc. Hp. Str. Ranjbaran’s music is more classical and romantic in its approach, choosing not to forgo melodies and harmonies for the sake of being groundbreaking. And what melodies! Ranjbaran has managed to create music that is at once an amalgamation of romantic poetry, which is the essence of Iranian culture with the epic sweep of its spirit, and all of that in the framework of western classical music, which in the end only serves to make the piece more coherent and beautiful. The perfect mixture of the old and the new, the east and the west. His “Persian Trilogy” is a set of three tone poems based on legends from the pre-Islamic Shahnameh (Book of Kings). 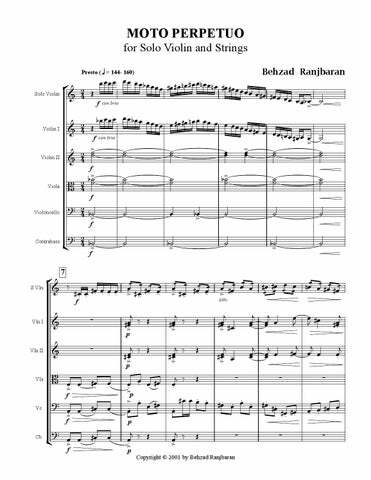 It is the Persian Kalevala, so to speak, and Ranjbaran has come up with three masterly contributions worthy of Sibelius. …layered textures of ravishing string sonorities. This intense work is an important addition to the chamber orchestra repertoire. “Ballade” is a five-minute work of moderate difficulty, and makes a wonderful addition to recital programming, both for the advanced student, as well as the professional. It’s good music that happens to be written for the bass – which is as it should be – and deserves to be played. …here is a contemporary work of interest that seduces at first. …gripped me most with its quietly troubled air. …a daring, original and intensely musical work. The piece left no emotion or instrumental timbre unexplored, and I suspect it will occupy a prominent place in the repertoire of the modern flute concerto. Each movement starts with an upward glissando, like pulling back a curtain on an inner world that’s explored in Persian-inflected solo flute soliloquies with a strong sense of subtext, reaching great emotional candor near the end of the slow movement in an eventful, satisfying musical journey. In less inward moments, the flute played a songful role that was engagingly hijacked by some mad flourishes taking the instrument to many extremes. …[Ranjbaran] fashioned a rich orchestration that constantly shifts in color and gesture. The music knew exactly what it was about, with melody and harmony drawn from, but not shackled to, Persian roots. Proportions felt instinctively right. 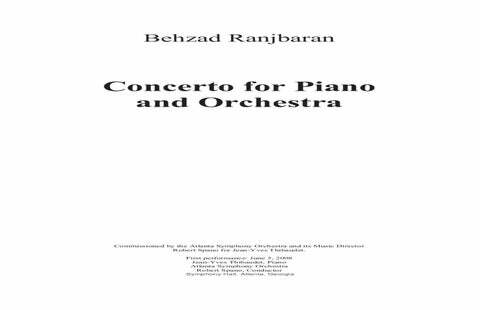 Like Rachmaninoff in 2011: Composer Behzad Ranjbaran’s “Piano Concerto” dazzles at Cabrillo Festival [headline] …extraordinary … thrilling. …florid and percussive, thundering and murmuring, lacey and craggy, epic and meditative, and often highly melodic. …plump with intriguing details… The nocturnal second movement…[had a]delicate, lovely dialogue between [soloist] Thibaudet and harpist Elisabeth Remy Johnson. 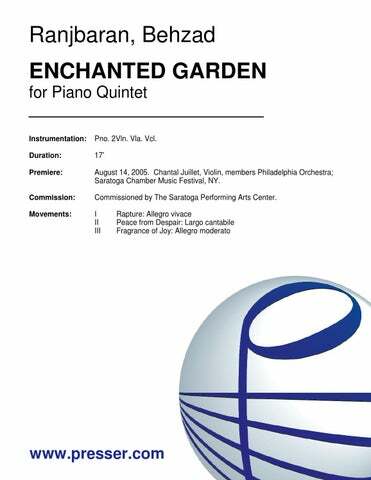 …compelling … monumental orchestral rhetoric and introduction of ancient Persian scales and instruments frame a piano contribution comprised of five extended cadenzas. The concerto’s dedicatee, Jean-Yves Thibaudet, contributed his undeniable star power to the festival with a performance notable for its digital wizardry and masterful tonal coloration. Ranjbaran is a master orchestrator and a canny exploiter of unique tones colors. …high class, cohesive, eminently listenable-to music. … Eastern exoticism, encased within a Western classical format …when the concerto… just sings out a fine melodic line, the effect is ravishing. The Tehran-born Juilliard composer might be thought of as music’s magical realist. In this work – as well as in his “Persian Trilogy” – a passage can be going along at midlevel dissonance when, as if a light suddenly refracted, the orchestration turns lustrous and the harmonies seductive. …rhythmic precision and dissonant tunings… But the piece is not just about modern musical stress. There are also long passages of beautiful, tonal, melodic writing. There is quite a good balance between the various elements. Ranjbaran has created a sophisticated work. It was a treat to hear this world premiere, and it would be a treat to heart it again and better explore its many complexities. This work has a reflective but articulate soul giving itself up in song. There is a touching cantorial first movement that also has a euphoric buoyancy… The lightness of being in the first movement returns for the flighty yet by no means shallow finale. This is music that whoops and dances on its toes with the effervescence of vintage Copland and Moeran. Attractive themes, well-marshalled and developed…a deserving companion and successor to his discmate Barber’s [cello concerto]. …totally lovable…a marvelous piece full of good tunes, and effective exchanges between soloist and orchestra. Even the long, rhapsodic opening movement really contrives somehow to cheat the clock, maybe simply because its thematic material is so instantly appealing. It would bring the house down in concert and deserves to be widely known. Ranjbaran’s music is solidly constructed in a very traditional style, with a strong emotional impact. …The cello solo often has the vocal character of a recitative. A lively folk-like theme introduced in the first movement is the main idea of the last, and other ideas return as well, helping to tie the whole piece together quite neatly. He (Tobias) shared his commitment to the work with his colleagues, and with the audience, which gave its enthusiastic approval. 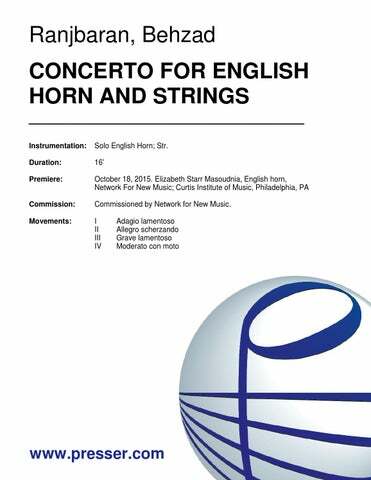 …a pleasant and often lyrical exploration of the possibilities of combining two instruments of such divergent pitch ranges. …a striking work that seems able to accommodate the various timbral possibilities of the bass without any feeling of awkwardness. 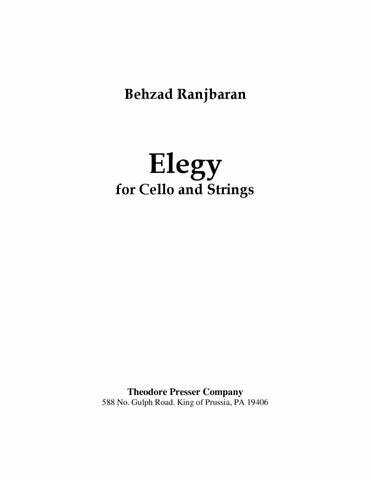 The ethereal “Elegy” [was] fragile, almost like a mirage… It was an admirable follow-up to the Elgar [Cello Concerto]. 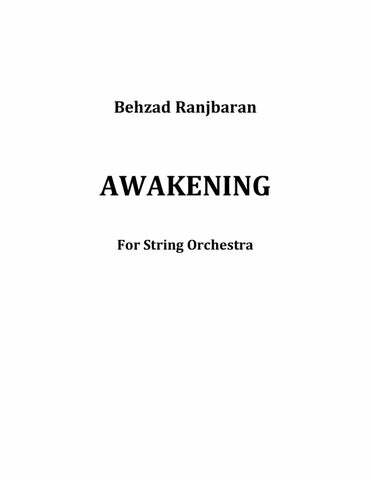 The musicians grouped themselves in a wide semicircle for Behzad Ranjbaran’s “Elegy for Strings.” The players never lost an ounce of Ranjbaran’s radiant luminescence. …music that falls easily on the ear while keeping your mind engaged. It also covered a lot of emotional and thematic ground in its dozen minutes, running the gamut from pensive to playful. 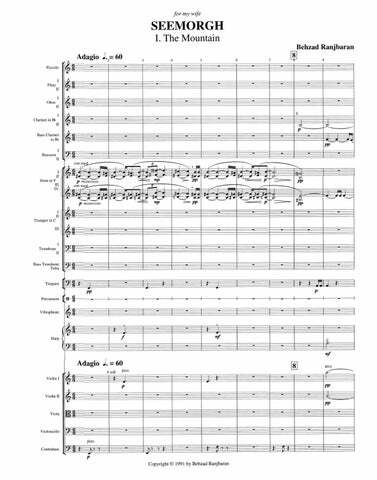 The score has a multicultural underpinning…the flute line…is meant to suggest the Persian version of the ney, a wooden flute used throughout the Middle East. And the music’s decidedly modal accent gives the piece a hint of exoticism without wresting it from the conventions of Western musical’s discourse. … Mr. Ranjbaran uses this hybrid language to paint a complicated picture…[of]…both the entrancing beauty and the brooding, fearsome mysteries of this Iranian garden. It proved a gripping piece. 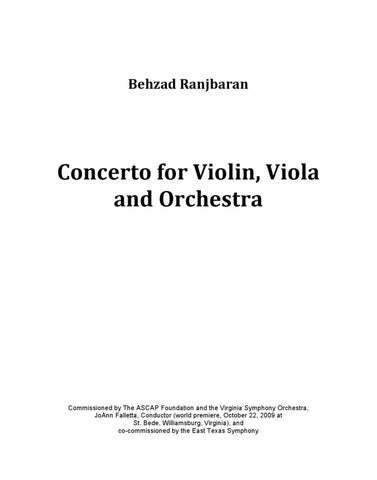 …a fetching composition… Mr. Ranjbaran has a consummate command of orchestration and instrumental color. 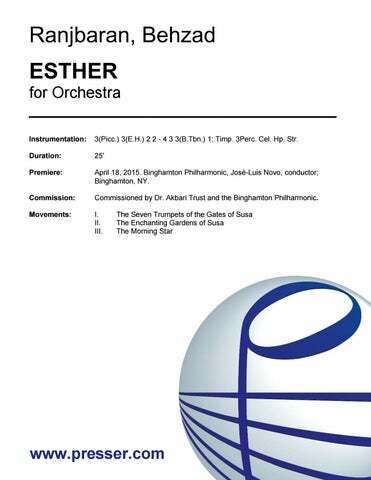 …a solid, very well orchestrated piece with lots of substance and character that is very enjoyable for the listener and visibly fun to play for the orchestra. Musician’s music. …sinuous melodic lines nestled in lush harmonies…extroverted and action packed, building to an epic scale. …evocative three-movement piece … lush exoticism. Terrific stuff, likely to prompt further investigation of his music. It could become a distinctive calling card of this fine young [Qatar Philharmonic]. 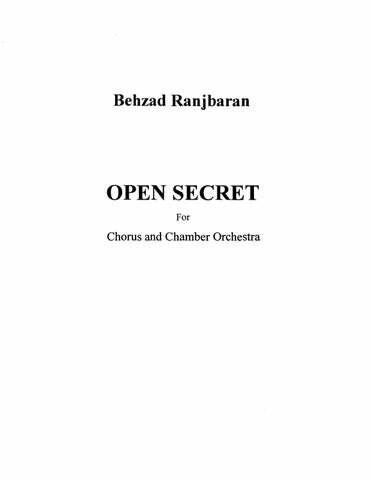 Ranjbaran’s mastery of orchestration is apparent in the delicious, delicate opening sonorities and in the full-throated declamations that follow as the hero conquers demon after demon… there is no denying the exciting thrust and sense of conquest that this music radiates. All seven passages are telescoped into a colorful overture. …roils and seethes and then drops stars from the heavens to drift, sparkling, to the earth. …The composer demonstrated that the dense structure of agitation, aggression, magic and humor that he offers up can be parsed to that three-note structure, which, in various contexts, can be heroic, mysterious or comic, as it were, establishing conventions for abstract thought. Saluting unsung heroes in “Seven Passages” debut. Are heroes born or made? 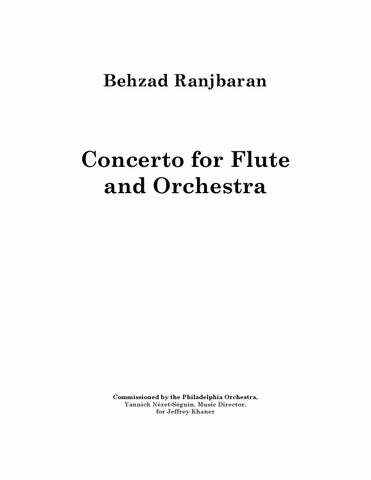 The latter, says composer Behzad Ranjbaran in his new “Seven Passages”… The heroic theme emerges in the course of the music. It doesn’t arrive fully formed, although it is adumbrated and appears in fragments as the work progresses from a fairy-tale gossamer beginning to its full-scale triumphant conclusion. 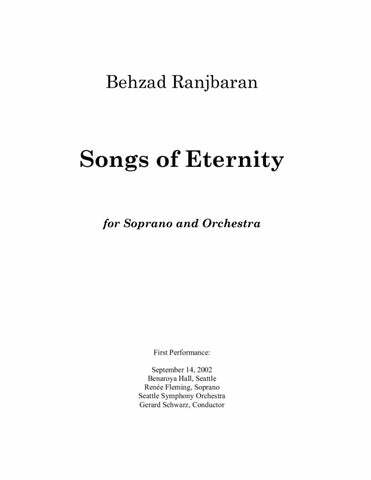 Ranjbaran… created in “Seven Passages” a clear and ringing argument for the continued survival and growth of symphonic form. He clearly recognizes the power of the orchestra… and uses its power to create rich, languid colors and pulses of striking emotional energy. Ranjbaran plays the colors of the orchestra with an unconscious mastery: here the entire gathering of forces on stage are at his command, and he uses that power with grace and ease. The audience joined in at the end of the work with a standing ovation for the young composer. [The work] showed organized, recognisable melodic and rhythmic themes, pulse, musical emotion and wit. 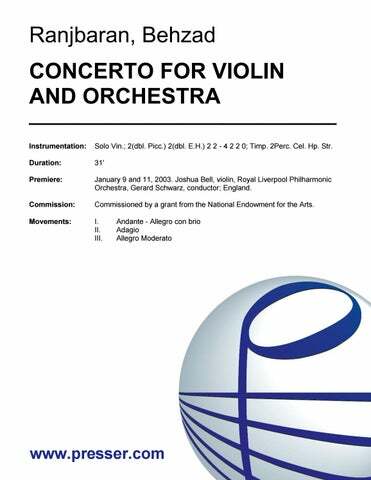 His love for the violin is evident throughout this skillfully written 20-minute piece. He writes with lyric beauty throughout the work. 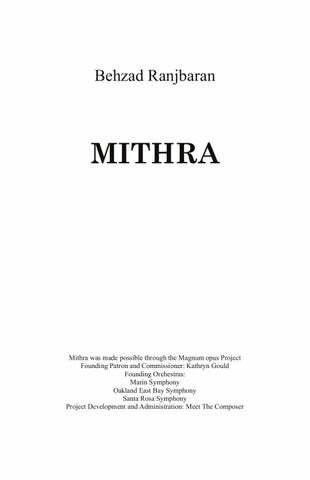 …certainly worth a second hearing… there was much to praise in the score, with its sense of restless motion, its attractive writing for winds, and an almost Wagnerian use of the orchestra. 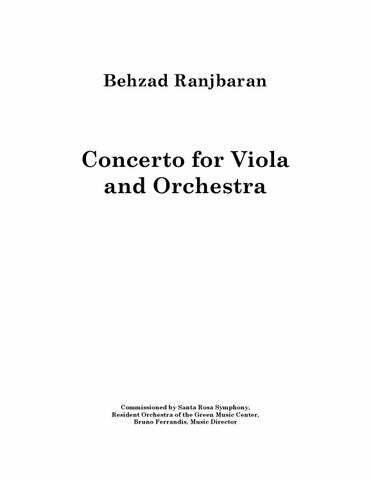 Ranjbaran would be a worthy successor [to Bartok]… Each of the three movements crackles with distinct character. The intense drama in each builds not just on volume and activity, but also on well-conceived harmonies that create and release tension… I could feel its coherence and its substance. Each of the three movements crackles with distinct character. The intense drama in each builds not just on volume and activity, but also on well-conceived harmonies that create and release tension. Like Bartok, Ranjbaran grasps the old Greek concept of catharsis to its core and achieves it in emotionally ambitious music. “The Blood of Seyavash” is one of the most breathtaking modern story ballets to come along in a long time. 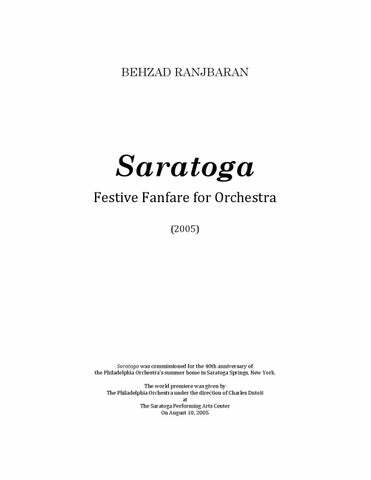 Ranjbaran has composed a noble and brilliantly conceived score, spectacularly orchestrated and filled with memorable tunes, meticulous development, and impressive craftsmanship. 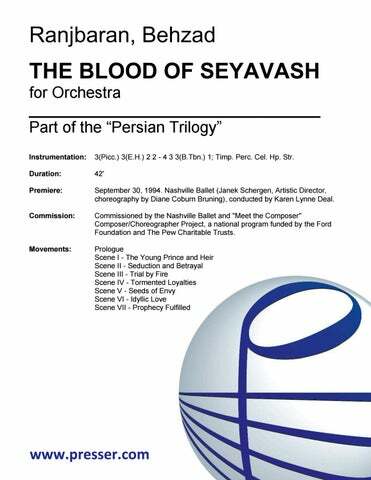 “The Blood of Seyavash” has the qualities of inherent beauty and strong musical structure that make it a satisfying musical entity. It is a rich experience as a ballet, but it is no doubt destined to be equally pleasing as a concert piece alone. Mr. Ranjbaran’s attractive Rumi settings were… philosophical. The poems are brief but eloquent, and Mr. Ranjbaran’s music had the effect of both magnifying their sense of mystery and clarifying their meaning. Particularly striking was the final movement, “Dance of Light,” in which a subtle exoticism and sense of antiquity shone through a Western harmonic frame. Ranjbaran’s work, which had packed so much local color and variety of expression into its short span, was warmly received by its first (and likely far from last) audience. It was clear from its bold, defiant start that this music would speak more about the determination to reach peace than about peace itself. The music brought to mind the strong declarative phrases and sonorities of the opening of “O Fortuna” from Orff’s Carmina Burana, and there was a similar spirit of dark urgency running through the entire work. …a very moving composition, and this listener, certainly among others, would like to hear it again.